It was a rub your eyes and look again headline. Did the United States really beat Brazil 4-1? And England 5-1? Sure, it was the U-17 squad, but yes, it happened. 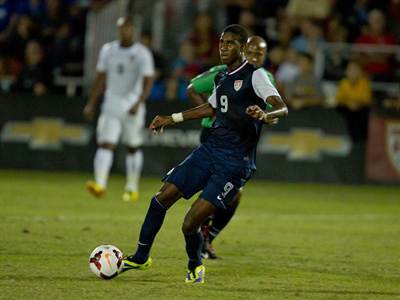 L.A. Galaxy prospect Haji Wright scored a brace against Brazil. The young Americans performance at the recent Nike International Friendlies tournament in Florida was a much needed tonic for U.S. Soccer fans. After failing to qualify for the Olympics for only the second time since 1980 and having a dismal one-point showing at the U-20 World Cup in successive years, youth soccer in America seemed to stall. However, those youth failures don't tell the whole story about youth development. The real barometer of how the national team will develop in future decades ultimately falls on the domestic league, as it does in most nations. Look at Mexico. After winning Olympic Gold, El Tri was the king of CONCACAF. Fast forward one year, a nail-biting World Cup qualification campaign and Graham Zusi’s canonization, and it’s clear that results at international youth tournaments should be taken with a grain of salt. In 2007, the MLS front office openly encouraged clubs to field youth teams, according to Boston Globe. In that article, Emily Kaplan highlighted the positive progress made by MLS youth academies, particularly the growth at the New England Revolution academy. Just watch Diego Fagundez play and you’ll see that Kaplan's assessment is an accurate one. Couple that with the recent announcement made by the New York Red Bulls regarding that construction of a $2 million centralized youth facility, and it’s clear that the academy model is the future for talent development at American clubs. Diego Fagundez is the latest MLS academy product to make an impact. In England, the academy system has been the norm for decades. Despite being one of the world’s most well-known nations in the game, the Three Lions have not achieved as much success as one would expect of a world power. It would be inaccurate to pin all of England’s problems as a soccer nation solely on the academy system. After all, the English have progressed to the quarterfinals in three of the last four World Cups, a record most countries would be proud of. However, Ince’s comments shed some light on the dangers of coddling young players. The United States has a chance to build a new academy system that isn’t based on English or European soccer, which is too often the standard to which American fans compare the domestic game. Next summer will be, as every World Cup is, a barometer to measure how the sport has grown in America. With a challenging group stage draw, the character of our squad will be tested. A squad that includes Clint Dempsey, Landon Donovan and Tim Howard, players who never had the luxury of living in an era of fancy academies or mainstream soccer support. Yet, they still managed to become incredible talents renowned for effort and fight. Let’s hope the developing academy system leaves future generations of American players with that same grit, rather than silver spoon that Ince laments.